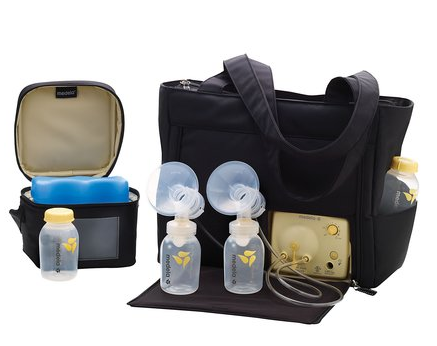 A decent daily-use electric breastpump like the Medela Pump in Style will run you $269.99 on Amazon. At the moment, I’m on my way back from the Society for Cinema and Media Studies, my first real trip away from the baby. The conference organizers were really helpful to me when I asked for lactation accommodation, finding me a room in the sold-out conference hotel so that I wouldn’t have to miss too much of the event. (Though this, of course, meant staying in the conference hotel, which I usually avoid in order to save money.) Still, it’s been a bit of a logistical challenge, involving trekking across airports in search of remote nursing rooms, sending a pump through security checkpoints, and absenting myself from events every few hours. In a perfect world, we’d all understand the mechanics of lactation so that we can accommodate women who are breastfeeding. But I’d be pretty wildly hypocritical if I condemned others for their ignorance, having until recently been in the same position myself. A few months ago, I was embarrassed to realize I had no idea where to send a woman who needed to use a breastpump at an event I’d helped organize. I didn’t even really know what she’d need, having never dealt with it myself. Which is to say that I understand why this stuff is confusing. So I thought I’d do my tiny part by explaining why we need what we need for the benefit of anyone who might host a breastfeeding mother. 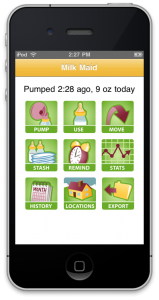 Maintaining a supply of expressed breastmilk is a complicated operation, involving considerations of supply, demand, inventory, expiration dates, stock rotation, storage space, and transportation. I use an iPhone app called, mortifyingly, Milk Maid, to help me keep it all straight. Women who are breastfeeding and are away from their children will probably need to use a breastpump every two to four hours (though this interval can vary a great deal from woman to woman). This is because going too long without expressing breastmilk can lead to engorgement, a painful infection, and a diminished milk supply. 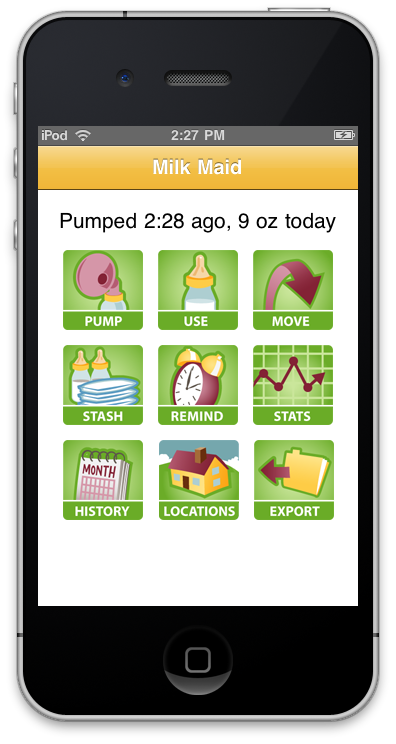 A breastfeeding mother will probably also need to save the breastmilk she pumps so that she can feed it to her child later (though sometimes mothers “pump and dump” if they can’t get the milk home easily). Pumping usually takes somewhere between 15 minutes and half an hour, plus time to wash parts and reassemble one’s outfit, though this, too, varies a great deal from woman to woman. Most women who pump frequently use electric breast pumps. So a breastfeeding mother will need, at a minimum, a private room with an electrical outlet. Public restrooms won’t work because they’re not very private, they may not have an electrical outlet, and they’re not very sanitary. Plus, frankly, it’s unpleasant to hang out in a public restroom for 20 minutes at a time. It’s really nice to have access to a fridge (even nicer if it has a freezer) to store milk, although many women have coolers for breast milk. It’s also nice to have access to a sink to wash bottles and pump parts (and dump milk if necessary). It’s also very helpful if I can pump at the last possible moment before I travel, because flights can be long and many airports don’t provide lactation rooms. This may mean extending my hotel checkout time, an accommodation that unfortunately proved impossible at the SCMS conference hotel. If the conference organizers had said something to the Drake Hotel’s management, it would have been easier to make my case at the hotel’s reception desk. So that’s all. It’s not too complicated. It’s really nice when someone anticipates these needs — as Jacqueline Wernimont did for this weekend’s THATCamp Feminism — so if you’re hosting a large group or you know that an attendee has a young child, you might just include a line about lactation accommodations in event materials or an email, the same way you offer accommodation to people with disabilities. As a matter of principle, I make a pretty vocal fuss about these things, but you can imagine why raising this issue is uncomfortable for many mothers. And, not that you would do this, but it has happened to me: Unless you know me really well, please don’t make a hilarious joke about breastpumping, recoil in theatrical horror when the subject comes up, or chide me for grossing you out. It makes me feel weird and gross, and heaven knows I’m not doing this for kicks. Thanks for this excellent and helpful post. I’m glad to hear that there are at least some accommodations now, although, as you say, it doesn’t help that all the assistive technology for Distance Nursing only ever goes so far. I don’t know if it’s appropriate to share a piece of my story here, but I offer it as further information about how one’s “choices” about feeding babies are constrained. My baby, unluckily, was intolerant of cow’s milk protein (and seemingly also soy), so I couldn’t give her regular formula. I had the option to a) adopt a dairy-free diet and nurse her or b) buy very expensive hypoallergenic formula for her. Being on a student budget, I chose a): thus, I was completely responsible for all her food for six months. I could have supplemented, but she also rewarded my dedicated efforts to breastfeed her by refusing to drink from a bottle for a few of those months. Babies are idiosyncratic and stubborn. So I was truly unable to leave her for long during this period; accommodation just wasn’t possible. 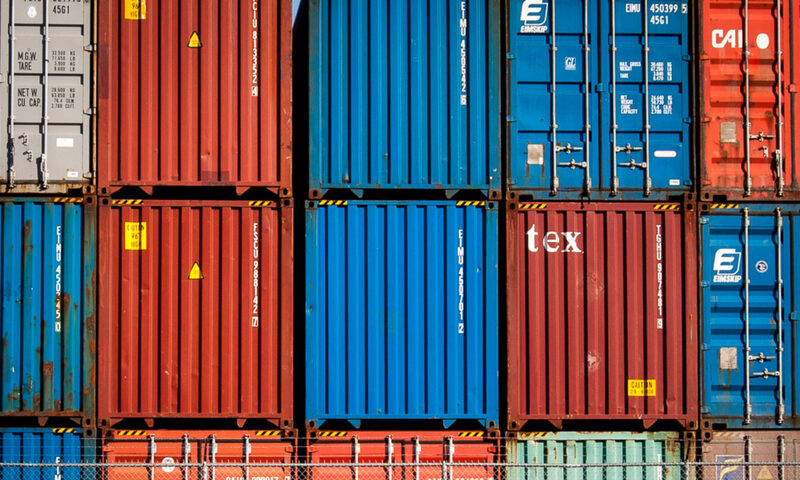 I made some of those choices in the short term, without knowing the constraints they would lead to later. Maybe if I’d put a bigger premium on my own mobility, I would have tried harder to force the issue: I certainly hadn’t intended for it to be impossible to leave her for more than two hours! But I would make a choice, and then she would “make a choice,” and the situation would evolve from there and have to be changed later, with great care and patience. Things did get easier as she got older, but to travel for any length of time, I would have had to buy some of the unappetizing, pricey formula before the trip, pump during the trip, and figure out what to do with the expressed milk once I got back (freeze the surplus for the next conference)? For a variety of reasons, I almost never did travel. I also discovered that not all freezers are equal: every frozen bag of milk I kept turned out, once thawed, to have spoiled, even after only a month or two. Portable milk coolers do not stay cool indefinitely. If you’re keeping the milk, I’d say that a fridge is absolutely necessary if you’re away for 24 hours or more, as well as a freezer to re-freeze the cooler’s ice pack. For rinsing the pump, even just a small, refillable water bottle and a cup to collect the runoff used to work when I didn’t have a sink. I also carried extra flanges so I could use fresh ones periodically and then wash them all at night. It strikes me that a source of fresh AA batteries would be a really nice bonus if an outlet was not forthcoming; my pump batteries died while I was running around a strange campus after a (non-academic) job interview, and I had to try to thread the power cord around several bathroom stall walls and “hang” the pump over the door so it would reach: all of that while in tooth-gritting engorgement agony. But I think the most important accommodation is being willing to listen to individual women’s individual needs — although oversharing like I’ve just done is clearly unnecessary. We should be able to ask clearly for certain things in advance, and we should be willing to hear such requests with sympathy and friendliness, putting anxiety, if not awareness, about all the politics of it to the side. Thanks again for such substantive help in that regard. What a great comment — thanks so much. One thing I didn’t mention in the post is that due to a variety of boring and complicated factors, I’m what they call an “exclusive pumper.” Which means that, by my calculations, I’ve spent about 50 hours in the last 30 days hooked up to a breastpump. It’s not what I’d had in mind, but you’re right: you make choices and they make choices, and you find yourself doing things you never expected. A friend of mind sent me this tumblr about baby-feeding, which I found really interesting. When I was nursing my daughter in 2000, I was asked to speak at a small conference, held at a retreat center across the country. I told them I’d be bringing my nurseling (I was paying our airfare to attend). The organizer responded by hiring a nanny, sending me the preliminary schedule, and asking which blocks of time she should expect to be caring for the baby! It worked out beautifully–the baby was onsite, I was productive, and nobody missed a feeding. I was the only one who had asked for such accommodation, so they didn’t have to scale this solution up. This happened to me too when I was breastfeeding. You don’t realize how many women need a special place to express milk until you are one of them! I’ve never found such a place… and always had to go “where no one is”, I admit it, at times it was the bathroom, but as you point out, it just doesn’t feel right or healthy for that purpose!